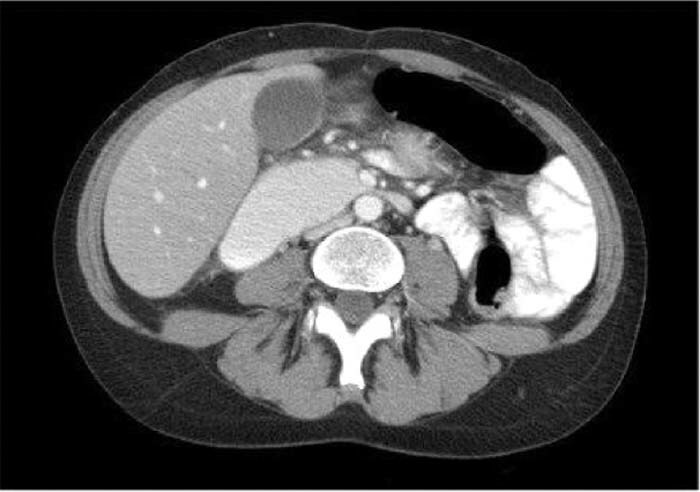 An 18‐year‐old man with a history of GERD transferred to our institution from an outside hospital for evaluation of refractory nausea, projectile bilious emesis, and abdominal pain. He had been in his usual state of health until 10 days prior to admission, when after eating out, he experienced this constellation of symptoms. On presenting to an outside hospital, his weight was measured at 49 kg (ideal weight 65 kg) and his height 170 cm. His vital signs were normal, his abdomen was soft with hyperactive bowel sounds, and he was hypokalemic with a serum potassium of 2.2. A CT of the abdomen and pelvis, HIDA scan, upper Gl, and EGD were all normal. An MRI abdomen had shown some narrowing of the visualized portion of the duodenum with proximal dilation. He was transferred to our institution, where a review of his abdominal MRI suggested findings consistent with superior mesenteric artery (SMA) syndrome. A further workup including a gastric emptying study and an abdominal MRA were normal. Vascular surgery concurred that the imaging findings of proximal duodenal dilation in concert with a history of bilious vomiting and a relative ability to tolerate liquids more than solids was consistent with SMA syndrome. A jejunal Dobhoff tube was placed, and he tolerated tube feeds. With around‐the‐clock antiemetics, he tolerated a soft diet. He was discharged home for an extended period of convalescence with enteral feedings and with a plan for subsequent interval assessment as to the need for surgical intervention. SMA syndrome is a rare and possibly overdiagnosed cause of postprandial epigastric pain, refractory nausea, and bilious vomiting. On initial presentation symptoms were suggestive of a proximal small bowel obstruction. It was ultimately thought to be caused by lack or loss of the mesenteric fat pad, which resulted in narrowing of the angle between the SMA and the third portion of the duodenum. This resulted in dynamic or persistent compression of the duodenum by the SMA and the resulting symptoms. Diagnosis required a high index of suspicion and ultimately rested on demonstration of duodenal obstruction with an abrupt cutoff in the third portion of the duodenum and active peristalsis. On MR imaging a narrow angle between the aorta and the SMA with high fixation of the duodenum by the ligament of Treitz could be seen. Initial management included decompression of the obstruction and enteral feeding with a jejunally placed feeding tube. With refractory symptoms definitive management was required and consisted of laparotomy with mobilization of the duodenum and transposition of the jejunum behind the SMA. SMA is a rare cause of postprandial abdominal pain, nausea, and bilious emesis. Diagnosis requires a high index of suspicion. Hospitalists should be aware of this clinical entity and invoke consideration when other causes of proximal small bowel obstruction have been excluded. Repaskey W, Flanders S. SMA Syndrome: The SBO Mimic. Abstract published at Hospital Medicine 2009, May 14-17, Chicago, Ill. Abstract 190. Journal of Hospital Medicine. 2009; 4 (suppl 1). https://www.shmabstracts.com/abstract/sma-syndrome-the-sbo-mimic/. Accessed April 25, 2019.